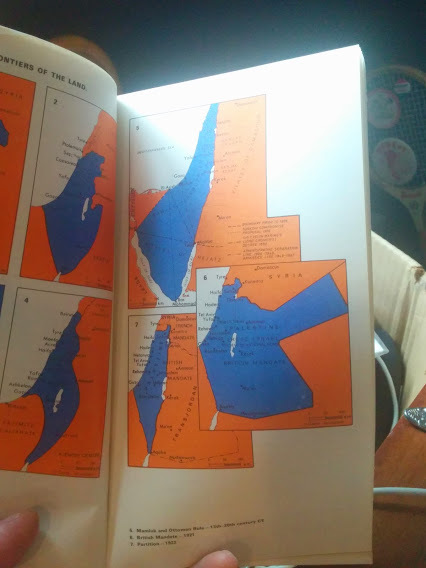 Here is a book called Facts about Israel, published by the Division of Information, Ministry of Foreign Affairs, I’m thinking sometime about 1975. There are 34,393 sqm within the cease-fire lines from the Six-Day War. The distance from Jerusalem to Haifa is 94 miles, to Tel Aviv a mere 38. Modern Israel has never known permanent boundaries. Jordan annexed the West Bank in 1950. (I don’t know when/if they released the claim). Ha’Aretz , the oldest Hebrew language newspaper, was founded in 1917. The Jerusalem Post, the oldest English language daily, in 1932. The Israel Communist Party had one seat in the Knesset at the time of publication. Men were in the Reserves until age 55. So, this isn’t about packing things up. It’s about What I Will do With Facts about Israel from 1975. To me it is a fascinating snapshot of a moment in time, that time when Jews traveled to the Sinai and the West Bank in tour groups (someone carrying a gun), but basically without fear. There were no big hotels in Sinai. Tourists slept on top of their sleeping bags under the desert sky. There were some grass shacks, but there wasn’t any plumbing. Israelis didn’t build anything, they knew they were leaving someday. They probably had no idea it would be so soon. I think that Camp David took us all by surprise. And then there is now. Most everyone hates us for being Jewish and Zionist, but we’re sort of used to it. Conservative (i.e. Republican Jews, shudder) have no problem. They can hate the liberal world for everything, from political policy to its anti-Israel zeal. For liberals like myself, we find ourselves at odds with the Left we are normally sympathetic to. We are not going to give in to anti-Semitic (because that’s what it is) propaganda just because we think that all Americans should have health insurance and that American defense spending should be lower and the death penalty is a travesty and that we need to spend more on infrastructure . Ain’t gonna happen. Like I said, shouldn’t I be outside, enjoying the ridiculously short New England summer?